Click Here To Receive Weekly Movie Reviews, Film News & Events! In the blazing Californian heat, we watch as a line of men make their way into Folsom Prison. 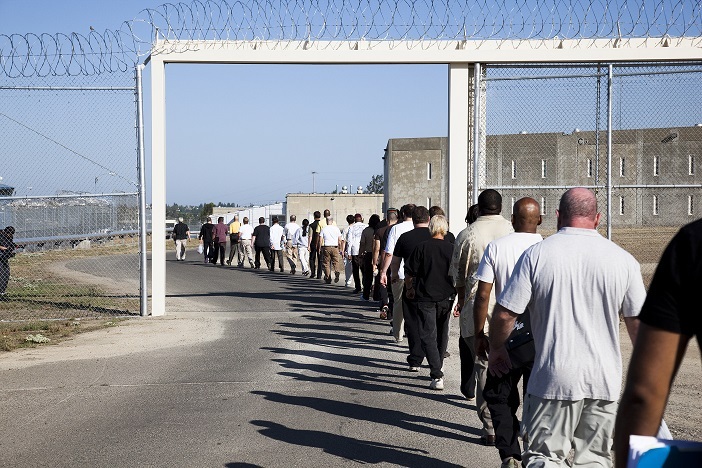 However, these are not convicts - they are visitors about to attend a four day Inside Circle therapy retreat with the incarcerated men inside. My first reaction to Jairus McLeary and Gethin Aldous’s fascinating documentary was scepticism. I felt compelled to question everything that I was watching. Why have these men decided to visit a prison for group therapy? Why would they be welcome? What would the men (convicted and free) gain from this experience? Are these sessions effective in the long term or just passing moments of mass hysteria? By the end of The Work, many of my questions were answered. In fact, some now seem irrelevant. 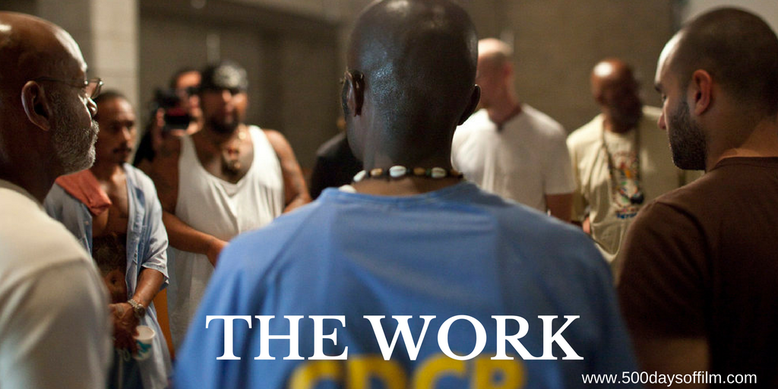 This is a film that explores the (often thin) line between the free and the imprisoned. It challenges our preconceptions and forces us to view these convicted men as humans - showing how many are victims themselves. However, that is not to suggest that The Work forgives or disregards the crimes that these men have committed. In several disturbing scenes we find out why they are in prison and (just as shocking) how long they have been - or potentially will be - incarcerated. Men explain in resigned, matter of fact tones that they have been in prison for 17 years or are serving two life sentences plus 50 years. It’s sobering stuff. These men meet their visitors in a therapy room and, bar a couple of short scenes, the film's action stays in this confined space. This is an incredibly intense, potentially volatile environment. While the men are respectful of one another, you sense that things could go very wrong, very quickly. And, at times, they almost do - particularly when one of the visitors makes careless and disrespectful remarks. Yet the appreciation for the Inside Circle programme is such that no one, regardless of their reasons for being there (and I did wonder about the impact of having a documentary film crew present), wants to ruin this opportunity for self-reflection and change. The stories of the free men are just as interesting as those of the Folsom prison residents. They reveal themselves in interesting, often insightful ways. While their reasons for joining the therapy retreat are different (some seem more genuine than others), they are united by a desire for change - a need to live a less conflicted, more fulfilled life. It is interesting to note that, rather than resenting their freedom, the inmates want to help the free men in their aim - perhaps to prevent them from making the mistakes that they themselves have made. As a result, many scenes in the documentary are incredibly moving and surprisingly uplifting. The Inside Circle therapy retreat depicted in The Work feels like a worthy and important programme. The documentary left me wanting more information. I wanted to know how much the experience helped the visitors in the days and weeks after the therapy sessions. I also wanted to understand more about the programme, its origins and how it helps the inmates in their rehabilitation. That the film does not provide these answers (apart from a couple of concluding lines at the end) felt a little frustrating. However, it is not hard, of course, to find this information (for example, you can find out more here) so, perhaps, The Work has done exactly what it intended. This is a documentary that will likely stay with me - a compelling portrait of a fascinating initiative. Have you seen The Work?